Summer is here and it's pretty much the time to try out and rock those pretty vibrant, sweat-proof and waterproof makeup you have. This is the best time to see if they live up to their claims! On the chopping board today is Too Cool for School's Check Hot Girl Lash which comes in 3 party rocking shades: Nuts Brown, Royal Blue and Raspberry Pink. This mascara collection comes in atypical colors (Royal Blue and Hot Pink) and a neutral shade (Nuts Brown) for those who are slightly afraid of lash colors. It is great for special and fun occasions like concerts and festivals (check out this bntNews article for a Festival Look using this mascara!). I received the shade Nuts Brown and I won't complain since I don't really wear colored mascaras expect for dark brown, which is very close to a black shade. I've tried a purple mascara before but I think I've only used it once and I kinda like it but it is definitely not something I would wear everyday. The Check Hot Girl Lash claims to create lash volume and provide vibrant color pay off that would make your lashes stand out. It also has a creamy texture and a Curl Up Polymer technology that provide long lasting, water and sweat proof formula that will maintain the curl of your lashes. It also contains black sesame, black soybean, and blackberry extract. I really like the wand for this mascara. It has an hourglass shape and has natural fiber bristles instead of plastic. This type of wand hugs onto the lash line perfectly giving it an easier comb through. The shade Nuts Brown is very different from the brown mascara shades I have seen in the market. Nuts Brown is a little bit lighter and has a more noticeable reddish tone to it that gives your eyes a definite pop. My dearest boyfriend definitely noticed it even if I only had one coat on. I can't say this is a volumizing type of mascara but it did pretty well on giving separation and definition on my lashes with one coat. Building it up was a different matter because on the third coat it was just looking thick and clumpy but the color was definitely more highlighted. Through a very hot day, my mascara coated lashes made it without any smudging but I'm pretty sure it won't survive a dunk in the water. It somewhat held the curl and even with just that I was impressed because I have very typical Asian lashes which are short and straight. 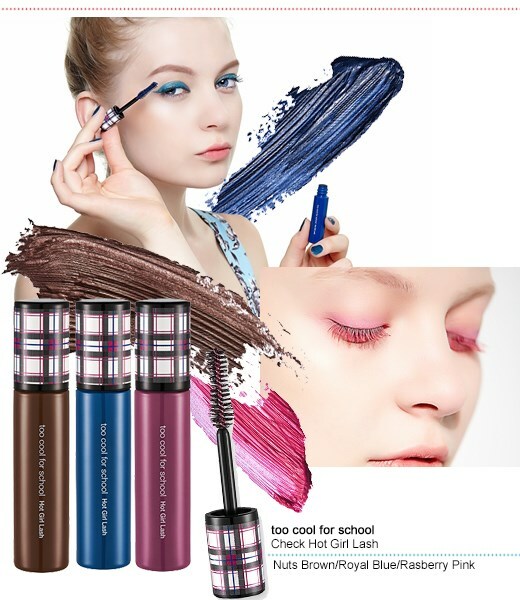 The Too Cool for School Check Hot Girl Lash retails for around $10 at Koreadepart. I pretty much had a good experience with this particular product. I love the brush which gave me ease and perfect control in application, I like the formula and the fact that it lasted throughout a hot day and slightly held curl. The color was pretty nice too and for somebody who loves neutrals but not completely opposed to colors, this is the perfect way to make the eyes pop subtly. It is a little bit pricey considering its only 6g which is a deluxe sample size in comparison to the typical mascara tubes in the market. I'm not that big on getting really voluminous lashes but I was expecting to get more volume from it without having it to clump that much. And though this product is indeed sweat proof, I prefer my mascaras to be waterproof since my eyes often gets watery and I don't want to risk having mascara run down my face. Overall it's a pretty decent product that is worth the try especially during the hot and fun summer months ! Don't forget to visit the other BNTGirls, Doris, Laven, Alene and Bella.